Join Rachel, Kirsty and Sasha for some fun with slime!Join Rachel, Kirsty and Sasha for some fun with slime! Join Kirsty, Rachel and Elsa for some magical festive fun!Join Kirsty, Rachel and Elsa for some magical festive fun! 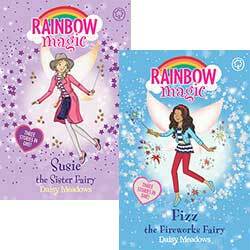 Fly away with Kirsty, Rachel and Sianne on the most magical fairy adventure yet!Fly away with Kirsty, Rachel and Sianne on the most magical fairy adventure yet! 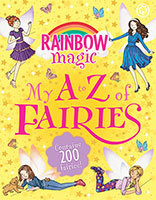 Get to know all the fairies and their friends - from Abigail to Zoe - with this fabulous guide to the world of the bestselling and much-loved Rainbow Magic! 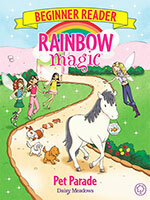 Learn to read with the Rainbow Magic Fairies!Learn to read with the Rainbow Magic Fairies! 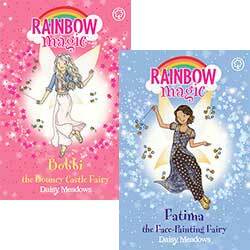 Another brand-new Rainbow Magic story featuring YouTube star Tiana from Toys AndMe!Another brand-new Rainbow Magic story featuring YouTube star Tiana from Toys AndMe!